It has M42 connection. Barrel shows almost no wear. By KMZ in 1979! INDUSTAR 50-2 3.5/50 Russian Soviet Lens M42 - Based on Zeiss Tessar. Lens mount: M42. Serial number:79057167 - Made in USSR. Focal length: 50mm. Scale of diaphragms: from 3.5 to 16. Filter mount: M35.5x0.5. The lens has very light cleaning marks, free of fungus. little dusty. may have gas bubbles. aperture and focusing operates smoothly. INDUSTAR-50 3,5/50 RUSSIAN M42 COATED LENS. The lens was manufactured by KMZ ("Zenit") optics factory. RING Adapter for Macro (You can do pictures. Lens Slightly Used! Lens has Tested! Lens INDUSTAR-50 Russian copy of the Carl Zeiss Tessar. ). LOT 10 x INDUSTAR 50-2 3.5/50 Russian Soviet USSR Lenses M42 - Based on Zeiss Tessar. Lens mount: M42. CLA'd (Cleaned/ Lubed/ Adjusted). Made in USSR. The Lenses are in Perfect Working Order and Looks Great! LOT 2 x INDUSTAR 50-2 3.5/50 Russian Soviet USSR Lenses M42 - Based on Zeiss Tessar. Lens mount: M42. CLA'd (Cleaned/ Lubed/ Adjusted). 7328380 -Made in USSR. 7664635 -Made in USSR. Focal length: 50mm. INDUSTAR 50-2 3.5/50 Russian Soviet Lens M42 - Based on Zeiss Tessar. Lens mount: M42. Focal length: 50mm. by KMZ in 1978! ⭐MINT⭐ - The Lens is in Fantastic Condition, Virtually New! Scale of diaphragms: from 3.5 to 16. INDUSTAR 26M I-26M 2.8/52 mm. Mounting optics - m39. The center / edge resolution is 30/12 lines / mm. Working length -28.8 mm. Photos of a lot intended as a sample! Serial numbers will not match with the item you get! Made in the USSR. The condition of the lens Macro Tubes Ring Set. In case with manual. The set includes Marco rings in original case with manual. Russian MC lens Industar 61 - 2,8/50. Coated lanthanum low-dispersion optics. 6-blade f/2.8 - f/16.0 diaphragm. Lens mount screw M42x1 mm (SLR M42). Lens tested. Glas Lens clean and clear. Analogue of the legendary lens Industar-61 LZ, but the smaller size of the lower price. By KMZ in 1982! INDUSTAR 50-2 3.5/50 Russian Soviet Lens M42 - Based on Zeiss Tessar. Lens mount: M42. Serial number:82095600 - Made in USSR. Focal length: 50mm. Condition: New, Unused surplus in Excellent condition. 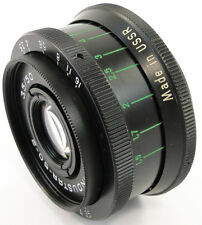 Industar-50 3,5 Lens M42 Mount i-50-2 USSR. A unique lens at a very affordable price! Russian lens Industar-50. The lens is in good condition, depending on the age. Detailed photos show the exact state. This option is popular for use as a "Pan-Cake" lenses on modern DSLR bodies with M42 screw mount adapter. Industar-50 was 50 mm f3.5, obtained from the Zeiss Tessar lens 4. Industar 50-2 lens USSR 3.5/50 mm M42 adapter Canon EOS. INDUSTAR 50-2 3.5/50 Russian Soviet Lens M42 - Based on Zeiss Tessar. Lens mount: M42. Serial number:84003351- Made in USSR. Scale of diaphragms: from 3.5 to 16. Filter mount: M35.5x0.5. Glass is clean and clear, no scratches, no dust inside, no fungus. 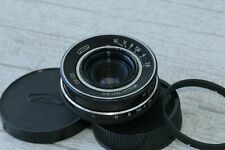 BLACK-WHITE INDUSTAR 50-2 3.5/50 Russian Soviet Lens M42 - Based on Zeiss Tessar. The Rarest Black-White Version - The Sharpest Version of Industar 50-2 Lens. from all others versions of Industar 50-2! INDUSTAR 50-2 3.5/50 Russian Soviet Lens M42 - Based on Zeiss Tessar. Lens mount: M42. Focal length: 50mm. The lens has 7 aperture blades! The Lens is in Perfect Condition. Scale of diaphragms: from 3.5 to 16. INDUSTAR 26M I-26M 2.8/52 mm. Mounting optics - m39. The center / edge resolution is 30/12 lines / mm. Working length -28.8 mm. Light Transmission - 80%. Photos of a lot intended as a sample! Serial numbers will not match with the item you get! INDUSTAR 26M RED "P" I-26M 2.8/52 mm. Mounting optics - m39. The center / edge resolution is 30/12 lines / mm. Working length -28.8 mm. Light Transmission - 80%. Photos of a lot intended as a sample! 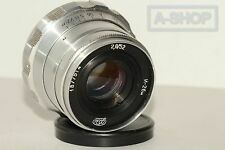 INDUSTAR 50-2 3.5/50 Russian Soviet Lens M42 - Based on Zeiss Tessar. Lens mount: M42. CLA'd (Cleaned/ Lubed/ Adjusted). by KMZ in 1976! The lens has 7 aperture blades! The Lens is in Perfect Working Order and Looks Great! Industar-50-2 50mm f/3.5. Focal length : 50mm. The lens is in Excellent condition. All are in working condition. The focus and aperture change smoothly. The lens is free of scratches, cleaning marks, fungus or dust inside. Industar-50-2 3.5/50 M42 Zenit. Very sharp lens, soviet copy of Carl Zeiss Tessar. screw mount M42. diaphragm scale: 3.5; 4; 5.6; 8; 11; 16. Focusing and aperture rings moves smoothly. Glass on lenses is clean, no fungus, lens in very good condition. Type of mounting screw - M39. Country/Region of Manufacture: USSR. Angle of view - 56 °. (Minimum focusing distance my this lens 0.4m). Flange focal distance - 27.5 mm (Flange focal distance my this lens - 28.8 mm). USSR Soviet Lens KMZ Vega-3 2. 8/50mm For Zenit-4. 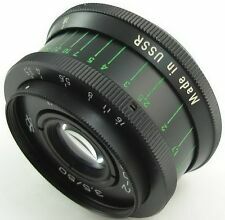 INDUSTAR 50-2 3.5/50 Russian Soviet Lens M42 - Based on Zeiss Tessar. Lens mount: M42. CLA'd (Cleaned/ Lubed/ Adjusted). Serial number:7561576 - Made in USSR. Focal length: 50mm. by KMZ in 1975! The lens has 7 aperture blades! Trending at C $24.74eBay determines this price through a machine-learned model of the product's sale prices within the last 90 days. INDUSTAR 50-2 3.5/50 Russian Soviet Lens M42 - Based on Zeiss Tessar. Lens mount: M42. CLA'd (Cleaned/ Lubed/ Adjusted). Serial number:7413075 - Made in USSR. Focal length: 50mm. by KMZ in 1974! The lens has 7 aperture blades! By KMZ in 1981! INDUSTAR 50-2 3.5/50 Russian Soviet Lens M42 - Based on Zeiss Tessar. Lens mount: M42. Serial number:81021053 - Made in USSR. Focal length: 50mm. Condition: New, Unused surplus in Excellent condition. By KMZ in 1986 ! INDUSTAR 50-2 3.5/50 Russian Soviet Lens M42 - Based on Zeiss Tessar. Lens mount: M42. Serial number:86040530 - Made in USSR. Focal length: 50mm. Scale of diaphragms: from 3.5 to 16. This option is popular for use as a "Pan-Cake" lenses on modern DSLR bodies with M42 screw mount adapter. Industar-50 was 50 mm f3.5, obtained from the Zeiss Tessar lens 4. Industar 50-2 lens USSR 3.5/50 mm M42 adapter SONY NEX-M42. This option is popular for use as a "Pan-Cake" lenses on modern DSLR bodies with M42 screw mount adapter. Industar-50 was 50 mm f3.5, obtained from the Zeiss Tessar lens 4. Fixing: M42. Item included adapter SONY NEX-M42. INDUSTAR 50-2 3.5/50 Russian Soviet Lens M42 - Based on Zeiss Tessar. Lens mount: M42. CLA'd (Cleaned/ Lubed/ Adjusted). Serial number:7405840 - Made in USSR. Focal length: 50mm. by KMZ in 1974! The lens has 7 aperture blades! This option is popular for use as a "Pan-Cake" lenses on modern DSLR bodies with M42 screw mount adapter. Industar-50 was 50 mm f3.5, obtained from the Zeiss Tessar lens 4. Fixing: M42. Item included adapter СANON EOS. LOT 2 x INDUSTAR 50-2 3.5/50 Russian Soviet USSR Lenses M42 - Based on Zeiss Tessar. Lens mount: M42. CLAd (Cleaned/ Lubed/ Adjusted). 78 01816 - Made in USSR. 81072460 - Made in USSR. Focal length: 50mm. INDUSTAR 50-2 3.5/50 Russian Soviet Lens M42 - Based on Zeiss Tessar. Lens mount: M42. CLA'd (Cleaned/ Lubed/ Adjusted). Serial number:7606124 - Made in USSR. Focal length: 50mm. by KMZ in 1976! The lens has 7 aperture blades!